UKIAH, CALIFORNIA (July 16, 2016) - 2014 Pacific Challenge Series champion Mike Beeler of Modesto became only the second repeat winner of 2016, and first back-to-back winner, taking a thrilling win in Saturday's round #8 at Ukiah Speedway. The PenneyLawyers.com-sponsored series produced an intense race on Fan Appreciation Night. Lodi's Matthew Wendt won the Sunoco Fuels Fast Time award after tying Beeler in qualifying with a 12.645 lap around the quarter-mile asphalt oval. The American Racer Tire dash proved his undoing as he only finished seventh while Loomis' Chris Scribner got the win for a set of tires and the pole for the feature. Scribner elected for the outside for the initial start and Manteca's JR Courage used that to his advantage to take the initial lead. Wendt wasted little time charging forward and was up to fifth by the fourth lap of the race. Courage took off for a small lead before Leytonville's Corey James and Beeler reeled him in. Courage consistently fought a loose condition forcing him to give up the bottom line to James. James finally jumped inside Courage down the backstretch on lap 28 but Courage shut the door hard to keep the lead. Shasta winner Tracy Bolin found a way to get around Wendt for fifth which dropped Wendt into a battle with Sacramento's Michael Roman. The battle got physical with lots of contact before they slammed doors in turn three and Roman took the position at the conclusion of lap 34. Wendt eventually escaped to the pits with a flat tire on lap 42. He was able to return to the race a short time later however. Roman spun off of the track in turns one and two for the first caution on lap 46 that set up a spectacular crash on the restart. Courage picked the inside line and raced side-by-side with James for half a lap, before James fell back into the clutches of Beeler. They raced side-by-side through turn four before James bounced off the wall, collecting both Bolin and Grass Valley's Don Swartz. Bolin suffered heavy front end damage that caused a fire under the hood as well. After a brief red flag, Roman, Wendt, and James all returned to the track but Swartz and Bolin were eliminated. Mike Beeler took his challenge to Courage on the restart and swept past him on the outside at the conclusion of lap 49. Beeler saw his lead ebb and flow by a car length to upwards of three car lengths all the way to the checkered flag, while Courage took on Scribner for second in a great battle. Beeler scored win number two of 2016 in a back-to-back victory to go with his win on July 2nd at Stockton. Courage, Scribner, Roman, and James rounded out the top-five. Beeler also won the Penney Racing Supply Hard Charger as well. For more information on the Pacific Challenge Series, visit them online at www.PacificChallengeSeries.com or on Facebook and YouTube. The Pacific Challenge Series is presented by: Penney Racing Supply, Penney & Associates, American Racer Tires, Maita Chevrolet, Compact-It, Northwest Compactors, Naake Suspension, Sunoco Fuels, Five Star Bodies, BrakeOMeter, Lefthander Chassis, ARP Bodies, Joes Racing Products, Bassett Wheels, Frank's Radio, WrapStar Pro, and Blakesley Sports Media. All PCS Super Late Models race ABC Bodies or Muscle Car bodies on American Racer Tires with Sunoco Racing Fuel. LOAN MART MADERA SPEEDWAY. 1/3 MADERA, CA. www.racemadera.com SATURDAY, JULY 16TH. Loan Mart Madera has a well known reputation for creating hot racing tickets and they're going to back that up Saturday night when they present the high flying Spears SRL Southwest Tour who will be running a 125 lap event. Also providing on track excitement will be the Madera Late Models, Madera Hobby Stocks, Legends of the Pacific, MST, Toyota Sedans and the Junior Late Models. The Loan Mart Madera weekend will begin on Friday with a special practice session from 2 to 9 pm. Saturday, race day, begins with a practice session for all divisions at 12 noon. Qualifying will begin for the local divisions at 145 pm followed by SRL practice at 515 pm, heat races at 4 pm and main events for the local divisions at 515 pm. Qualifying for the SRL Southwest Tour will start at 7pm. The 125 lap feature will go green flag status at 9pm. General admission tickets, age 13 and up, are $20. Tickets for seniors and military personnel are $17. Youth tickets, age 6 to 12, are $10 while kids age 5 and under admitted free. STOCKTON 99 SPEEDWAY. 1/4 MILE. STOCKTON, CA. www.stocktonspeedway.com SATURDAY, JULY 16TH. Stockton 99 will be treating their fans to short track action featuring their Stockton Late Model, Bomber, Basic 4 Cylinder and Grand American Modified divisions. The weekend will begin on Friday night with a practice session, open to all divisions, from 4 to 8 pm. Entry fee for the practice is a $40 pit pass for all ages. On Saturday race day the spectator gates will open at 5 pm followed by racing at 6 pm. Adults tickets, age 16 to 59, are $15. Tickets for juniors, age 11 to 15, and seniors are $10. Kids age 10 and under will be admitted free. UKIAH SPEEDWAY. 1/4 MILE. UKIAH, CA.www.lakeportspeedway.com SATURDAY, JULY 16TH. The 2016 Lakeport - Ukiah Challenge will be held at Ukiah Saturday night in what is going to be a very special evening. The speedway will be presenting a combined Armed Forces and Fan Appreciation Day. The racing agenda for the evening will be highlighted by a special guest appearance from the Pacific Challenge Series, widely regarded as being one of the most exciting late model regional touring series from the left coast. Also providing on track action will be Taco Bell Bombers, the California Vintage Series, Hard Tops, Jammers and the Pro 4 Modifieds. The front gates will open at 330pm with the racing receiving the green flag at 5pm. A tip of the racing hat goes to the Anderson Logging Company for sponsoring this special evening. The presence of Armed Forces and Fan Appreciation Night will be felt at the ticket gate as well. Military personnel and first responders will be admitted free with a valid ID. In the name of fan appreciation the general admission grandstand will be reduced to $5. Kids age 5 and under will be admitted free. A field of 19 cars takes the green flag at Speedway Willow Springs, a very challenging one quarter mile paved oval located in Rosamond-California. The field exits turn two and then makes a sudden hard left turn around a large tractor tire strategically placed at the bottom of the back stretch. This move, in turn, sets up a rather tricky entrance into turn three. Next, the field roars off of turn four only to perform another meet and greet with another tractor tire located at the bottom of the front stretch. That tight left hand turn sets up a tricky approach to the start-finish line to complete the lap. So, exactly what is this unique form of racing? In this particular case it's the So Cal Enduros led by Promoter Danny Quinn. In less than two racing seasons Quinn's promotional efforts has turned his series into pure excitement that brings the Speedway Springs' fans to their feet. 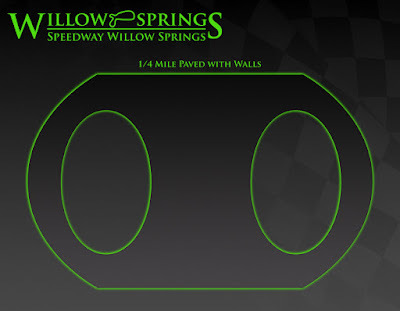 It has become a major staple to Saturday night racing at Speedway Willow Springs that sells a lot of tickets. A native of Ridgecrest-California, Quinn's entry level into the world of racing came at the age of seven when he won a kart race at the former Pearsonville Speedway. With the support of his father, Ed Quinn, he made his stock car debut in the hobby stock class at Pearsonville in a 1974 Chevrolet Nova. 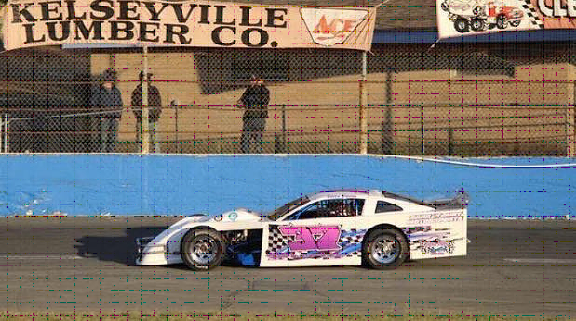 Recalling his early racing years, Quinn said "in 1991 we began to get serious and ran the second half of the season in a street stock at Pearsonville. We won the final main event of the year while earning the Rookie of the Year title. The next six years began an adventure of epic proportion. My Dad and I traveled to more than 15 different race tracks, sometimes racing at two different tracks during the same weekend. racing against the best hobby and street stock talent on the west coast. There were many times that we felt we were out of our league but I was always learning while holding my own and winning quite a few races." In addition to success at Pearsonville, where he won the 1999 hobby stock championship, Quinn tasted success at the dirt tracks at Bakersfield and Victorville where he won the sport mod championship by a narrow one point margin. In 2011 the Quinns took on the blessed role of parenthood when their beautiful daughter was born. Five years later a son joined the family. With a smile on his face, Quinn said "of course that put the brakes on the racing a bit." Anyone who has had the privilege of getting to know Danny Quinn is well aware of the fact that he's a very good driver and race car fabricator. Much to our surprise we would later discover that he's also a very good promoter. This was a case of that old saying "the acorn didn't fall far from the tree." His Dad, Ed Quinn, is regarded as being a successful businessman whose intense love of auto racing led him to participate in all aspects of the sport from driving to fabrication and promoting events. When it came to promoting racing, Danny Quinn was there to help his Dad and it was at this point in time when he honed his own promotional skills leading to the creation of the So Cal Enduro Series. Recalling those days he said "my Dad spent over 20 years promoting racing, working at race tracks and just being involved in every aspect of motorsports at tracks all over southern California. I guess his interest in all of this rubbed off on me. I have promoted many types of events over the years and finally had an opportunity to promote full scale auto racing". Regarding the popularity and success of the So Cal Enduro series, he said "I find it very satisfying to know that people enjoy what I'm presenting to them. If the crowd is cheering I'm happy. I'm very proud of what the racing class has done so far and I can't wait to see what's to come in the future" he said adding "ultimately none of this would have been possible without the Speedway Willow Springs promoters and staff who took a chance on a hair brained idea that I presented." Quinn also made quick work in signing sponsors for every race on his schedule this year. "We have enormous support from a bunch of great sponsors. Our sponsors are responsible for us being able to guarantee our winners portion of the purse. I think the fact that the racers can be certain that the $300 to win money is guaranteed regardless of our car count count, brings them to the racing class with some confidence," he said. Quinn pointed out that a major part of his design for this racing series was based on good economics. "The So Cal Enduro Series is an economical low cost class," he said adding "the cars are limited to front wheel drive, 3 to 6 cylinder non performance stock vehicles. We have seen everything from Geo Metros to mini vans. But what we see most is affordable fun racing." The economics associated with this series also makes a perfect entry level for newcomers to try their hand at racing. When asked how much someone could expect to spend to build and race an enduro car, Quinn said "someone with a little fabrication and welding skills can be pretty thrifty and do much of the fab work themselves. Realistically, I would say the average cost to build the car should be easily under $1,000 if the vehicle is purchased at the right price. I have seen cars purchased and built for less than $400. But that's buying a $150 running car and scrounging used parts and safety equipment. That's getting harder for sure. But it's still much easier and cheaper than finding a 1970 to 1980 V 8 car these days." Regarding the mandatory safety equipment the cars are required to have a rollover cage, racing seat belts, a window net and a fire extinguisher. Drivers must wear a full faced helmet, fireproof driver uniform and gloves. Quinn is extremely safety minded when it comes to his racing series and said "as we go, the cars are getting faster and we can foresee more roll cage and other safety equipment in the future." Whether he schedules twin main events or double heat races running in opposite directions at the same time, Quinn is always considering new ideas to make the enduro series a little more unique and fun for the fans. A case in point will be displayed this Saturday night, July 16th, when the series will get down and dirty by making their debut at the Bakersfield Speedway, a one-third mile, high banked, dirt track. Commenting on Saturday night's dirt debut, Quinn said "running on the wet clay should change things up a bit. The cars slipping and sliding around should keep the racing tight and keep it exciting. In addition, we are allowing the Bakersfield Speedway mini stock class to run with us as well. The big change there is they run rear wheel drive cars as well as front wheel drive. This will be the first time that we've allowed rear wheel drive cars and it's going to be experimental for the July 16th race. It should be interesting." The schedule for the remainder of the 2016 season will have the series returning to their home base at Speedway Willow Springs on August 13th followed by a return visit to the Bakersfield Speedway on September 10th. 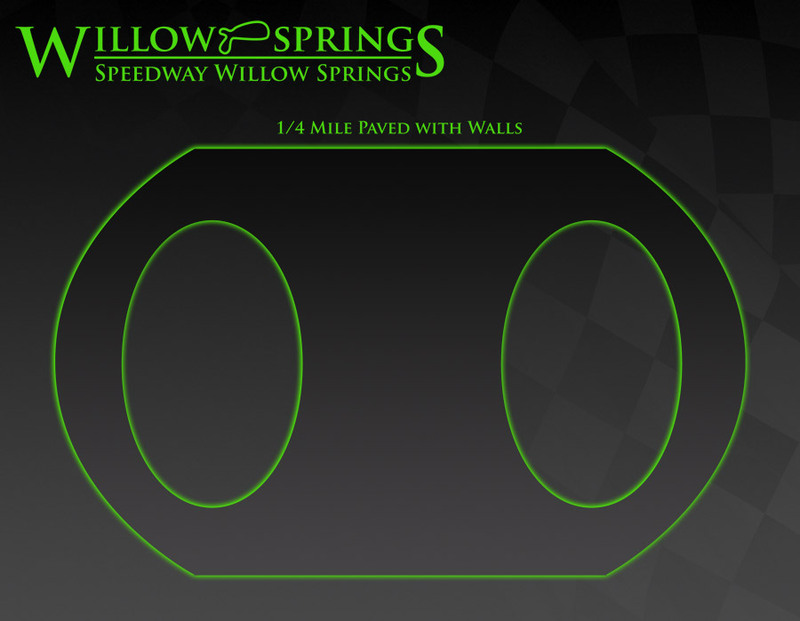 The series will close out the season at the Speedway Willow Springs with double dates on October 1st and 22nd. If you're looking for something unique at a race track then you need to check out the So Cal Enduro Series. When you combine unique race formats with a healthy car count fortified by Danny Quinn's promotional skills then you've got a sum total that is well worth the price of a ticket. The So Cal Enduro Racers are supported by a highly potent, and much appreciated, group of sponsors that includes: DRC Pump Systems, Swift NAPA Auto Parts, A To Z Graphics, Snap On Tools of Ridgecrest, Motion Tire Motorsports, Sierra Auto Recycling, Casey's Steak House and Sauces, Rain Man Hobbies and Raceway and Team BBRL, Mienert's Industrial Supply, So Cal Racers Swap Meet on Facebook and Raw Motorsports, the Speedway Willow Springs and the Bakersfield Speedway. This Saturday night the SPEARS Southwest Tour Series will hit the midway point of its 2016 season with its annual stop at the 1/3-mile LoanMart Madera Speedway for the “Race for Autism 125”. CHAMPIONSHIP - Entering Madera this Saturday night, two-time series champion, Derek Thorn holds the lead in one of the tightest championship battles ever at this point of the season. Campbell Motorsports’ Thorn leads with 680 points, with two wins, followed closely by second year driver, High Point Racing’s Ryan Cansdale with 675 points and two wins. NTS Motorsports’ rookie, Christian McGhee is a close third with 650 points. MILESTONE START – Keith Spangler of Porter Ranch, CA will make his 75th SPEARS Southwest Tour Series career start this weekend at Madera. Spangler will move into second in all-time series starts, behind Troy Ermish who holds the record at 95. RETURNING TO THE SERIES – Former Madera Speedway Champion, Justin Westmoreland will debut a brand new car this weekend. Westmoreland has 40 career starts in the series and will be making his first SPEARS Southwest Tour Series start of 2016. DEBUT DRIVERS – In addition to Westmoreland, three other drivers will also make their 2016 SPEARS Southwest Tour Series debut this weekend at Madera Speedway: Three-time NASCAR K&N Series champion, Eric Holmes, 2015 Pacific Coast Challenge Series champion, John Moore, and his son and teammate Cole Moore. TOP ROOKIES – With an average finish of 3.5 over the first four races of the 2016 season, Christian McGhee of Claremont, CA has a solid lead in the 2016 Rookie-of-the-Year Challenge. Rounding out the top 5 in the rookie standings are; Andre Prescott, Matthew Meech, Trevor Huddleston, and Austin Reed. MOST WINS – Derek Thorn and Ray Lawson, Jr. are tied for the most career SPEARS Southwest Tour Series wins at Madera Speedway with five apiece. TRACK RECORD – The SPEARS Southwest Tour Series one-lap track record at Madera Speedway is 13.482 set by Jim Pettit II on April 16th of 2013. For more information on this weekend’s SPEARS Southwest Tour Series event at LoanMart Madera Speedway, go to, www.SouthwestTour.com, or www.RaceMadera.com. Celebrating its sixteenth season in 2016, the SPEARS Southwest Tour Series is a regional stock car series competing on paved ovals in the southwestern portion of the U.S. http://www.srlsouthwesttour.com. “The SPEARS Southwest Tour Series…Where the Champions Race”. About SPEARS MANUFACTURING: Spears Manufacturing is a world leader in plastic piping products. SPEARS’ maintains over one million square feet of manufacturing facilities in four states and nine distribution centers across the USA for worldwide distribution. For more information go to http://www.spearsmfg.com. 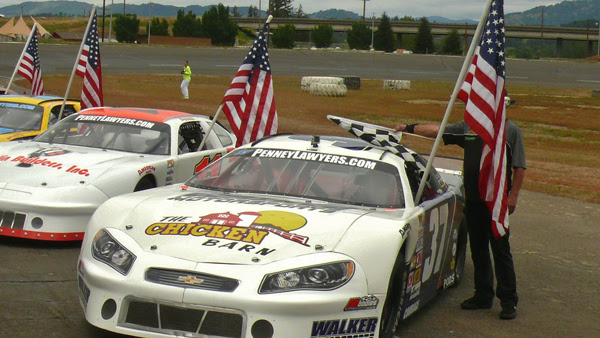 SACRAMENTO, CALIFORNIA (July 12, 2016) - The Pacific Challenge Series presented by PenneyLawyers.com returns to Ukiah Speedway for the second time in 2016 as the touring stock car series competes at the quarter-mile asphalt oval on Saturday night. The races will be the Armed Forces & Fan Appreciation day with all active military and first responders free, and adult general admission only $5! It has been a fast-paced season for the PCS with six different winners and six track records broken over the course of the seven races so far. Upperlake, CA's Jeremy Doss leads the series standings heading into the event with five consecutive top-three finishes including the win on a rain-delayed Ukiah event on Mother's Day. Doss will not be on hand to defend his race win, leaving the door wide open to the rest of the PCS competition. Modesto's Mike Beeler used a green-white-checkered finish to win the Firecracker 100 as part of the Ron Strmiska Memorial at Stockton 99 Speedway on July 2nd. Beeler's win propelled him to second in the championship. In six career Ukiah starts, Beeler has four top-fives and six top-tens including a runner-up performance this year. JR Courage of Manteca has been steady throughout the 2016 Pacific Challenge Series to jump up to third in the standings. Courage navigated through the late-race dramatics at Stockton to finish fourth for his best run of the year that helped him move up the standings. He has also added fifth place finishes at Shasta and Ukiah to complete his resume. Tracy's Jeff Bischofberger ranks fourth overall but will also not be in action on Saturday night. That makes Saturday's races big for fifth in the standings Tracy Bolin. 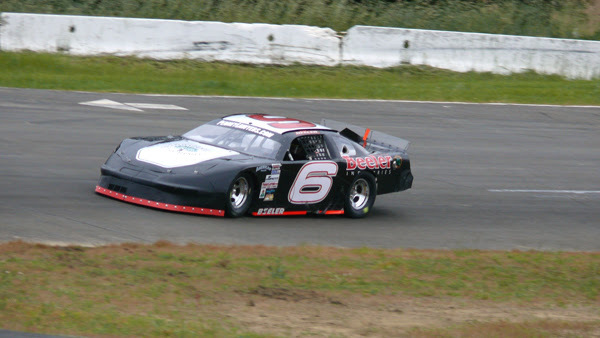 The Valley Springs driver set the track record at Madera Speedway to open the season and followed that up with a win at Shasta Speedway as well. Bolin crashed out of the most recent race at Stockton but finished fourth at the first appearance of the year at Ukiah. Cole Moore had turned his season around with back-to-back third place finishes in June at Shasta and Roseville but failed to finish the Stockton race. The Bill McAnally Racing NASCAR K&N West driver was initially the fast time qualifier at Ukiah in May before his team was unable to make the Sunday Mother's Day start. Matthew Wendt is the highest rookie in the standings from seventh position and recently finished sixth at Stockton and fifth at Roseville. 2015 PCS champion John Moore is on the comeback trail after a tough start to the season, with the Granite Bay driver up to eighth after a come-from-behind third place run at Stockton. Elk Grove's Mike Hite ran fifth at Stockton to move up to ninth overall ahead of Hayward's Danny Malfatti. Loomis' Chris Scribner is aiming for his PCS return this weekend out of position #11. Grass Valley's Don Swartz, Jeremy Hopkins, and Jimmy Stillman also intend to make their returns to action on Saturday. Racing activities get underway Friday night with practice beginning at 5 p.m. and including a team BBQ. Pit gates open at 3 p.m. and pricing is $30 per person with no car fee. On Saturday grandstands open at 3:30 p.m. with racing at 5 p.m. Racing will include the Taco Bell Bombers, Vintage Hardtops, Jammers, and Pro 4 Modifieds. Tickets are just $5 for adults for this great fan appreciation night! Lakeport, CA - The North State Modified Series made their way to Ukiah Speedway this past weekend and Furia seemed pretty content with taking on this track as it is her hometown track. Ukiah is one of the tracks that 19-year old Sierra Furia has been racing on for over 4 years and has had many wins there. Friday night practice started off with good thoughts for Furia and her team. “It was great to roll out of the trailer and be fast. We have been fighting major bad luck since the beginning of the season and I believe we are moving forward, fast.” explained Furia. Saturday approached and Furia still felt content with the race. “We had been getting faster and faster all day. It did pay off in the long run as we qualified 10th out of the 22 cars that showed up.” said Furia. After a good qualifying run, that set Furia to start 10th in the main. Furia managed to work her way up to 8th, with strong battles between Sullivan and Furia. “It felt good to be able to run in the top 10 with this series and have some strong battles. I believe we could have been better but the car got tight and we started to fall back” explained Furia. This was Furia’s first top 10 finish with the North State Modified Series and will not be her last. “We have ran three races with this series, and have not had good luck. It has been tough to get the car right even at the home tracks. We will be coming back for more and will continue to get better every weekend. I can not thank my parents for the support throughout this. My crew chief Noel McCormick for pushing me and everyone at the shop who gets me out here every week” said Furia. You can catch her at Redwood Acres Raceway in Eureka, CA on July 23rd. Sierra would like to thank her sponsors Schaeffer’s Racing Oil, Furia Construction, OGIO, Bob and Carol, S&K Automotive, and Sand N Dirt Motorsports. July 9, 2016 - Ukiah, CA - Jason Philpot of Sacramento jumped ahead of pole setter Cody Thompson of Fremont at the drop of the green flag and lead wire to wire to capture his third season victory in the North State Modified Series at Ukiah Speedway Saturday night in the Protect the Harvest North Coast 60. 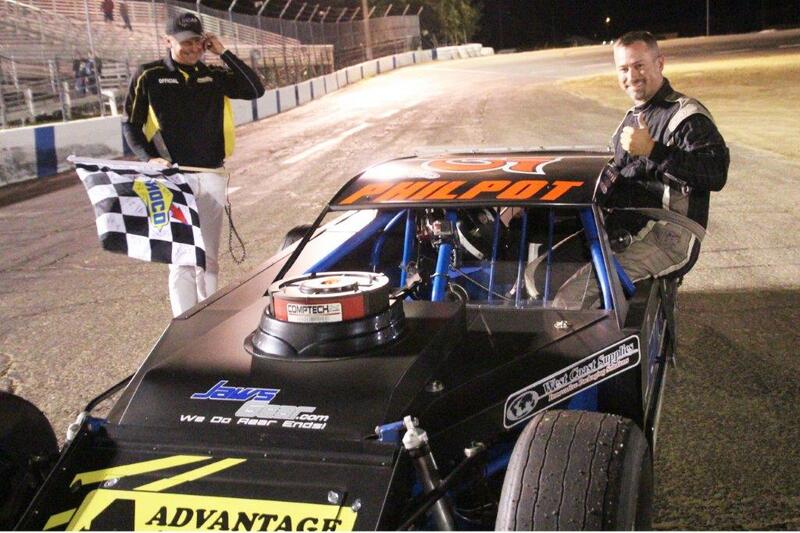 Philpot's other wins were at All American Speedway in April and Madera Speedway on June 11. Michael Mitchell of Loomis earned the Penney Racing Supply/Sunoco Fast Time Award by setting fast time of 12.980 seconds, only .046 seconds off the NSMS track record of 12.934 seconds held by Tripp Gaylord of Golden Colorado. Mitchell drew number 4 in the Sinister Diesel inversion pill draw , placing Thompson and Philpot in the first row, points leader Darrin Knight of Kelseyville and Mitchell in row two, and Petaluma's Richie Potts and Kelseyville's Darin Snider in row three. The first of three yellow flags flew on lap four when Darrin Sullivan spun in turn four while running seventh. All cars avoided contact to continue the race. Philpot chose the outside lane for the double-file restart, forging ahead again, but once more the action was slowed when Potts spun in turn two. With nowhere to go, both Richard Knight and Codi Barba collided with Potts resulting in all three pitting for repairs. Potts and Barba were able to continue, but Knight's car suffered too much damage, ending his run. Philpot chose the high side of Thompson once again and drove away at the drop of the green flag. Knight and Mitchell battled for third behind Thompson with Darin Snider, Charlie Collins and Mike Collins next in line. David Lyndall and Sierra Furia joined the front runners as Sullivan worked his way back into the top 10. Mitchell dove under Thompson for second on lap 7 as Charlie Collins tried his luck in the outside groove. Collins and Knight swapped places back and forth for several laps until Thompson drifted high allowing Knight to sneak under him and into third on lap 14. At the Swartz Diesel half-way point Philpot was way out in front of Mitchell, Knight, Thompson, C. Collins, M. Collins, Lyndall and Furia. Charlie Collins drove by Thompson on the 47th circuit, and six rounds later Snider drove off the track on turn four ending the long green-flag run. All lapped cars were funneled to the back of the pack for the single-file restart, and the final laps went without incident with Philpot collecting the $1000 for first place. Mitchell finished second with Knight third, Charlie Collins fourth and Thompson fifth. Rounding out the top 10 were Mike Collins, Lyndall, Sierra Furia, Bryan Denton and Oregon driver Rich Cobb. In the Lucas Oil Dash for Cash Charlie Collins collected $100 for the win, with Sullivan getting $50 for second. Collins also earned the Wenteq Hard Charger Award . The Naake Suspension award went to Potts, and Furia earned the DJ Safety certificate. Lyndall and Barba took home the Scribner Plastics. The next North State Modified Series event will be at Redwood Acres Raceway in Eureka on July 23. The North State Modified Series is presented by: Protect the Harvest, Swartz Diesel, Lucas Oil, Sinister Diesel, Penney Racing Supply, American Racer Tires, Naake Suspension, Sunoco Fuels, Five Star Bodies, Wrap Star Pro, Wenteq, Scribner Plastics, DJ Safety, and the Buckhorn Bar & Grill. POST FALLS, Idaho (July 9, 2016) – They came across the finish line, two of NASCAR's rising young stars, leaning on one another as sparks flew and sheet metal crunched Saturday night. In the end, it was 16-year-old Todd Gilliland who took the checkered flag in the Toyota NAPA 150 and celebrated in Victory Lane on the quarter-mile, after edging fellow NASCAR Next driver Noah Gragson by inches. Gilliland crossed the finish line .004 seconds in front of the 17-year-old from Las Vegas. It was the only lap Gilliland's No. 16 NAPA Auto Parts Toyota led all night. But it was enough to give the third-generation driver from Sherrils Ford, North Carolina, his third West win and fourth K&N Pro win overall in his rookie season. Multiple cautions pushed the race to a second green-white-checkered finish and to 166 laps. Gragson led the final restart and was a nose ahead at the line taking the white flag. But Gilliland got a strong run off Turn 4 coming to the checkered, and powered forward despite having his car pinched against the outside wall by Gragson's No. 7 Speed Vegas/Alert ID/Colliers International Ford as they crossed under the flag stand. The Toyota NAPA 150 is the second NASCAR K&N Pro Series race to be decided by less than .01 seconds this season. 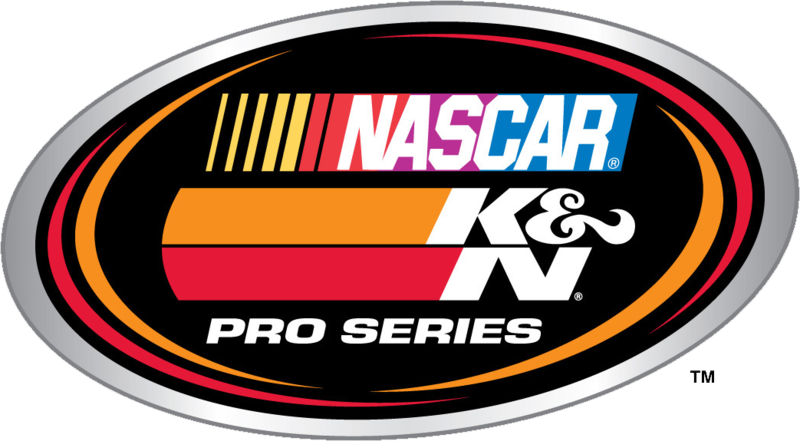 Spencer Davis edged Justin Haley by .005 seconds in the NASCAR K&N Pro Series East race at Virginia's Dominion Speedway in May. Gragson was third in that race. Chris Eggleston was third in a bittersweet finish. Earlier in the day, the defending series champion earned his first career Coors Light Pole Award. He led a race-high 73 laps. But he was collected in a spin by Gilliland on Lap 92. The two Bill McAnally Racing teammates quickly sliced back through the field, but it was Gilliland who got to the front first and Eggleston had to settle for a podium finish. Gragson's teammate Gracin Raz overcame a black flag -- for jumping the restart while leading on Lap 91 -- to finish fourth, and Julia Landauer rounded out the top five. Cole Rouse was sixth, followed by Riley Herbst, Will Rodgers, Matt Levin and championship points leader Ryan Partridge. Partridge saw his chance for the win disappear on the first green-white-checkered attempt when he spun in Turn 4 coming to the white flag. Partridge got hung on the outside when Gilliland made it three-wide under Partridge and Gragson on the initial restart. That set up the final duel between Gilliland and Gragson. Partridge holds a three-point lead on Gilliland. Eggleston is 10 points behind Gilliland and Gragson is another four points back after seven of the series' 14 races. The NASCAR K&N Pro Series West will next race in the annual combination showdown with the NASCAR K&N Pro Series East at Iowa Speedway on Friday, July 28. The Toyota NAPA 150 will air on NBCSN on Friday, July 15 at 2 p.m. ET..
1. (7) Todd Gilliland, Sherrils Ford, N.C., Toyota, 166 laps, 36.798 mph. 2. (3) Noah Gragson, Las Vegas, NV, Ford, 166. 3. (1) Chris Eggleston, Erie, Colo., Toyota, 166. 4. (6) Gracin Raz, Lake Oswego, Ore., Ford, 166. 5. (9) Julia Landauer, New York, N.Y., Toyota, 166. 6. (11) Cole Rouse, Fort Smith, Ark., Ford, 166. 7. (14) Riley Herbst, Las Vegas, Nev., Toyota, 166. 8. (15) Will Rodgers, Murrieta, Calif., Chevrolet, 166. 9. (13) Matt Levin, Tucson, Ariz., Ford, 166. 10. (2) Ryan Partridge, Rancho Cucamonga, Calif., Ford, 166. 11. (8) Blaine Perkins, Bakersfield, Calif., Chevrolet, 166. 12. (12) John Wood, Eagle, ID, Toyota, 166. 13. (17) Stafford Smith, Eagle, Idaho., Chevrolet, 163. 14. (5) Cole Moore, Granite Bay, Calif., Toyota, 163. 15. (10) Ron Norman, Tucson, Ariz., Ford, 159, overheating. 16. (4) Braeden Havens, Spokane, Wash., Chevrolet, 154, suspension. 17. (19) Salvatore Iovino, Los Angeles, Calif., Toyota, 154. 18. (16) Jesse Iwuji, Dallas, Texas, Toyota, 149. 19. (18) Rich DeLong III, Santa Clarita, Calif., Chevrolet, 143, accident. Lead Changes: 7 among 5 drivers. Lap Leaders: C. Eggleston 0; R. Partridge 1; C. Eggleston 2-73; G. Raz 74-90; C. Eggleston 91; R. Partridge 92-139; N. Gragson 140-165; T. Gilliland 166. Standings: 1. R. Partridge, 291; 2. T. Gilliland, 288; 3. C. Eggleston, 278; 4. N. Gragson, 274; 5. G. Raz, 263; 6. J. Landauer, 258; 7. C. Rouse, 253; 8. R. Herbst, 250; 9. M. Levin, 228; 10. R. Norman, 223.